need to start and run a successful business. Solo & Smart is designed to give individuals all the tools they need to start and run a successful business. Send invoices on the go, track payments, automatically put aside savings for tax, add in pay as you go insurance and stay on top of your numbers. Get all the tools you need to start your business on the right foot. 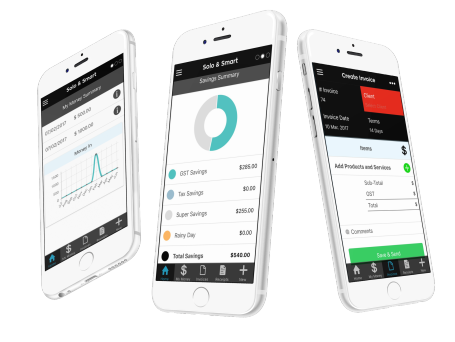 Solo & Smart allows you to create simple invoices on the go, with an easy to use app. Choose a portion of your income to be put aside as savings for your tax, super, profit or other commitments. Capture a copy of all your receipts using your phone and keep on top of your numbers. Access our pay as you go insurance innovation, allowing you to only pay for insurance that you actually use. Already have an accounting software? No contracts or credit cards required, only pay for what you use. Access unlimited invoicing, quoting and receipt collection. Full access to the system including automatic savings, tax management, cash flow automation, insurances and payment tracking. Because Solo & Smart was developed by self-employed Australians for self-employed Australians, we understand the challenges of business and the systems you need to overcome them. Our app has developed through working with thousands of self-employed individuals to discover what the keys to success are. We believe there has never been a better time to be in business for yourself and these courageous individuals deserve the lifestyle and success they dream of. Access the system with no commitments and get started growing your business in seconds.